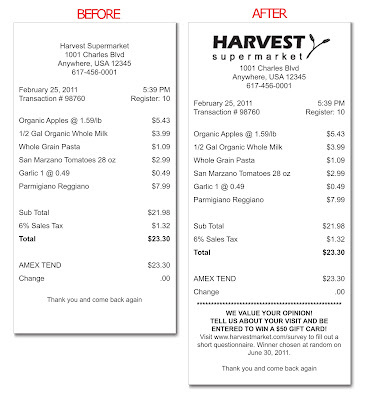 Here is an example of a Before and After receipt. You can see that along with the addition of a logo, the bottom now includes a survey with the chance to win a $50 gift card. Top retailers such as Wendy's, Home Depot, Dunkin' Donuts, WalMart, Starbucks, Target and JCPenney (just to name a few!) are taking advantage of the space at the bottom of their receipt paper rolls to engage customers. Find out what you are doing right and what you can improve on by including a short survey. Don't forget that a happy customer is your best customer! If you are new to online surveys, check out these sites for more information: Survey Monkey, Constant Contact, Zoomerang and Question Pro. Many offer free accounts if you have ten questions or less on your survey. 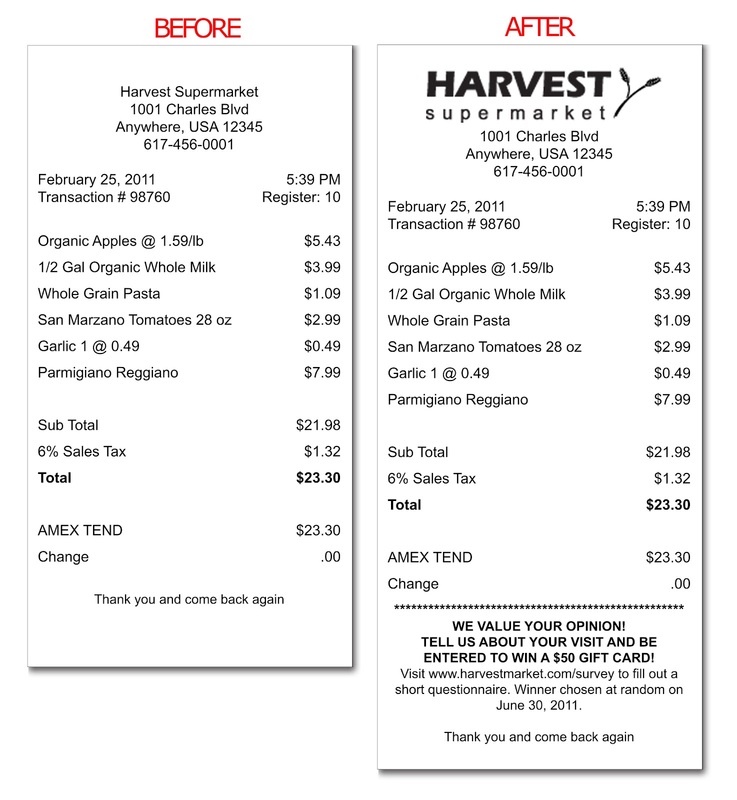 Most importantly, don't be afraid to experiment with your receipt marketing. Sometimes it takes a little trial and error to find something that works for your business. The key is to engage your customer and let them know that you value their business and their opinions. Have you ever compare SurveyTool.com and Survey Monkey . SurveyTool provided free online survey and more new template provided. Surveytool is best as compare to survey monkey.